Fahe is on a mission to eliminate persistent poverty in Appalachia. Our unique collaborative model connects a Network of local, regional, and national leaders, all working together to uplift our nation’s rural places. Working with our Network of 50+ nonprofits across the Appalachian portion of Kentucky, Tennessee, West Virginia, Virginia, Alabama, and Maryland, we use our expertise in finance, collaboration, innovation, advocacy, and communication to achieve a more prosperous Appalachian region. With a focus on leadership, housing, education, health and social services, and economic opportunity, Fahe empowers the people and communities of Appalachia with the resources, opportunities, and tools needed to build a better life. Our strength in numbers creates positive change in Appalachia, one of the poorest and most difficult regions of the country to serve. Since 1980 Fahe has invested $784.8M generating $1.43B in finance. This investment was channeled through our Members and community partners, directly chang­ing the lives of 535,000 people. Fahe has several lines of business that are utilized by our Membership, Partners, and Appalachian families and businesses. Mortgage Lending – JustChoice Lending (JCL), our Mortgage Lending Department, is a full service mortgage lender that strengthens communities by creating successful homeowners. JCL offers many types of mortgage loans including USDA 502 Direct, USDA 502 Guaranteed, VA, FHA, Conventional, and Refinancing. JCL is the only nonprofit third party originator for Chase and has been instrumental in creating a national nonprofit packaging system for USDA RD 502 Direct loans. Community Lending Services – Fahe couples a Community Loan Fund (CLF) with outstanding lending expertise to facilitate the flow of impactful private and public investments into housing and community development projects across the region. Strategic Programs – Fahe’s Strategic Programs department effectively utilizes a combined 40+ years of expertise to help Member and non-Member clients navigate challenges, cultivate innovations, and take concepts from pilot to production. Membership – The Membership team strengthens our Network by connecting the Members to each other and to Fahe’s expertise and services. 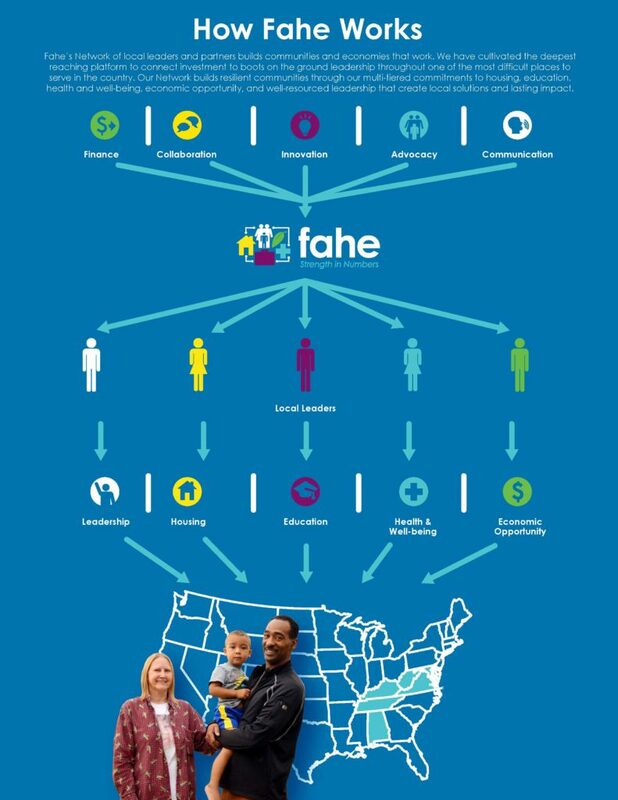 Fahe’s 50+ Members in six states get access to specialized training, information sharing, financial resources, and a stronger combined political voice that supports positive change in their communities. Loan Servicing – Fahe Loan Servicing emphasizes quality customer care and personalized account management on the mortgages we service for Fahe, our partners, and our borrowers.